The latest monthly QV House Price Index shows nationwide residential property values for May increased 9.7% over the past year which is the slowest annual rate in two years. Values rose by 0.4% over the past three months and the nationwide average value is now $634,018 which is 53.0% above the previous market peak of late 2007. When adjusted for inflation the nationwide annual increase drops slightly to 7.4% and values are now 27.8% above the 2007 peak. Residential property values across the Auckland Region increased 9.3% year on year which is the slowest annual rate of growth seen since November 2014. Quarterly value growth remains flat, rising just 0.1% over the past three months. The average value for the Auckland Region is now $1,044,561 and values are now on average 91.1% higher than the previous peak of 2007. When adjusted for inflation values rose 7.0% over the past year and are 44.0% above the 2007 peak. Values across the Auckland Region are continuing to plateau with values increasing by just 0.1% over the past three months. However, values in Rodney – North continue to show steady growth, rising more than any other area, up by 15.5% year on year and 3.9% over the past three months. While values dropped back 1.1% in Auckland City’s Eastern suburbs including St John, Meadowbank, Glenn Innes, Point England, Orakei, Kohimarama, Mission Bay, Ellerslie, Greenlane and Stonefields. “We are also seeing vendors who are willing to withdraw their properties from the market if they do not achieve the price offer they are wanting”. Hamilton City home values rose slightly by 0.9% over the past three months. Values were 12.3% higher than in May 2016 and they are now 48.6% higher than the previous peak of 2007. The average value in the Hamilton is now $537,152. Tauranga values rose at a faster quarterly rate in May than during April up by 1.3% over the past three months and 15.4 % year on year. Values there are now 41.9% higher than the previous peak of 2007. The average value in the city is $683,012. Meanwhile, Western Bay of Plenty values have increased 14.6% year on year and 3.5% over the past three months. The average value in the district has now topped $600,000 to reach $602,059. 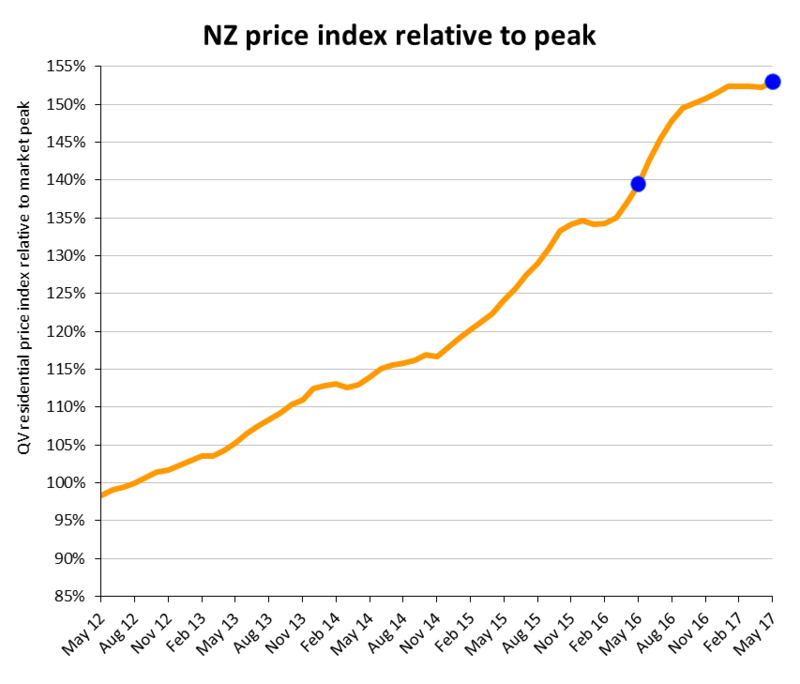 The QV House Price Index shows values across the entire Wellington region rose 20.4% year on year and 3.1% over the past three months and values are now 33.4% higher than in the previous peak of 2007. The average value across the wider region is now $607,907. The Kapiti Coast District saw the highest value growth over the past three months with values rising 4.5%; followed by Wellington City’s Western suburbs where values rose 4.4% over the same period. Christchurch City values rose just 1.0% in the year since May 2016 and decreased by 0.7% over the past three months. They are now 30.5% higher than the previous peak of 2007. Dunedin home values are continuing on an upward trend, they rose 15.5% in the year since May 2016 and 3.9% over the past three months and values are now 30.6% above the previous peak of 2007 which is on par with the percentage Christchurch values are above 2007 levels. The average value in the city is now $373,810. Nelson home values rose 16.1% year on year and 2.7% over the past three months. The average value in the city is now $527,974. Meanwhile values have jumped 6.7% in the Tasman District over the past three months and are 18.8% higher than in May last year. The average value in the district is now higher than Nelson and is $534,908. Values continue to rise across the Hawkes Bay region and Napier values rising 19.3% year on year and 4.1% over the past three months. The average value in the city is now $436,454 and values are now 28.3% above the previous peak of 2007. The Hastings market also continues to see strong value growth rising 21.9% year on year and 4.2% over the past three months and the market is now 32.8% higher than 2007. The average value there is now $413,801. Values increased over the past year in all provincial areas of the North Island and there has been particularly strong growth in areas where values have been flat for many years including East Coast areas such as Opotiki where values rose 22.5% year on year and 12.9% over the past three months; also in Gisborne where values rose 19.1% in the year since May 2016 and 3.2% over the past three months and also in South Waikato District where they jumped 32.0% year on year and 4.5% over the past three months. In provincial areas of the South Island most areas saw values rise over the past year with the MacKenzie District rising 35.6% in the year since May 2017 and 9.6% over the past three months; Central Otago was also up 20.3% year on year and 6.4% over the past three months and values in Westland began to rise again by 11.4% year on year and 5.7% over the past three months after.